A glancing—and incomplete—biography of the novelist, borscht-barrel philosopher, and egotist. Documentary filmmaker Britting places due emphasis on Ayn Rand’s life in Hollywood, a life to which she had long aspired but discounted as she became a renowned author; some of the still photographs of Rand (1905–82) as an acting student and budding screenwriter alone are worth the price of the book, a volume in the well-made Overlook Illustrated Lives series. Moreover, Britting does a good job of recounting Rand’s adolescence and early adulthood in the nascent Soviet Union, where she was lucky to avoid punishment for her anticommunist views and bourgeois background. 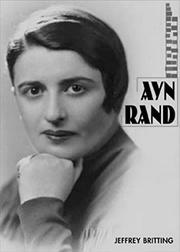 Even as a young girl, Rand cultivated the arch disdain for which she would become known; convinced that “real life and real intelligence and real people” lay far outside the “accidental cesspool of civilization” that was, in her view, Russia, she got out as soon as she could, talked her way into a job with Cecil B. De Mille, and was soon concocting stories and scenarios involving brave loners battling evil empires. Britting, an acolyte of Rand’s, is uncritical of his subject, whose cultlike circle of anticommunist intellectuals, ironically called “the Collective,” included fed chairman Alan Greenspan; he glosses over some of the more sensational aspects of Rand’s life, including a later much-publicized (thanks to Barbara Branden’s 1986 memoir, The Passion of Ayn Rand) romance with another adept, the psychologist Nathaniel Branden. Admiring and semiofficial though it is, however, Britting’s life gives readers cause to nod admiringly at Rand at least here and there; she was convinced of her brilliance, to be sure, and prickly with those who were not similarly convinced, but she also fought for every cent she made and worked hard at her craft. A useful primer for readers wanting to understand Rand’s influence (today largely confined to conservative undergraduates).